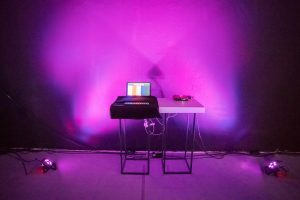 In February 2018 I was invited by Artercitya on a (still on-going) residency as an audio artist in a very large international project called Freiraum, organised by the Goethe-Institut and funded, amongst other important funders, by the Creative Europe Programme of the European Union. In the project, 38 cities in Europe, are dealing with the question of freedom in Europe today and consider where or how this freedom might be in danger. (You can find details on Freiraum here: http://www.artbox.gr/2017_freiraum.html). During the unit, ArtBOX, who organise the 3rd Artecitya Art Science Technology Festival – THE NEW NEW, realised by the Thessaloniki International Fair – HELEXPO, with the support of the Creative Europe programme of the European Union, came to the university and students had a chance to present to them prototypes of their graduate production work. As a result, two of our BAMP Level 6 graduating students and my own supervisees, Daniel Bell and George Fisher, whose work fulfilled the brief of this new media arts event, were selected and presented their work, along with mine, in this major international exhibition, ​THE NEW NEW​, in Thessaloniki –Greece between September 8 -16 2018. The three artworks, Daniel Bell’s Spectra, George Fisher’s Echoes in Space and my own Air Free, were very warmly received by the visitors and first survey results from the even organisers suggest that the work was seen by over 10.000 people and that the exhibition was voted amongst the most popular events in this major international fair. Echoes in Space consists of 8 unique soundscapes and visuals themed after each of the planets’ characteristics. 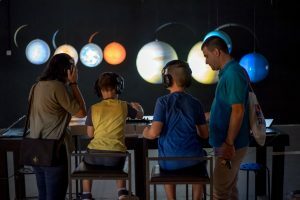 These soundscapes are an artistic reimagining of the Voyager probes recordings, though scattered throughout are real excerpts from the original Voyager recordings. Echoes in Space is a blurring of reality and crafted content; it asks the viewer to consider the divide between reality and fiction. As well as to understand the difficulty in comprehending what is real and what is crafted when you find yourself confronted by the unknown, and to ask oneself if there truly is a difference? 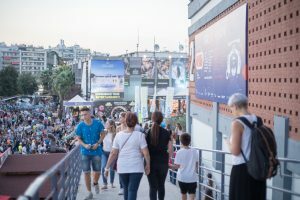 The first iteration of my artwork Air Free that was presented in Greece, is made up of interviews with members of local communities in Thessaloniki, responding to questions on isolation and freedom. As a response to the Freiraum brief, the artwork is now entering a second phase. During this phase, I will be visiting Carlisle (UK) in order to conduct further recordings with members of the local community there on the same themes, by bringing the recordings from Greece to them. These new recordings will then be used along with the recordings from Thessaloniki in a second iteration of the artwork, which will be presented in an exhibition organised by the Goethe-Institut in Berlin Germany, between 12-13 March 2019. My own work for Freiraum, due to its themes and very large scale international reach, lends itself rather strongly for an impact study, which I am now working on. Particularly looking at how the work brings forth issues of isolation in Europe today by bringing the voices of local communities, including the voices of minorities, in communication with each other as well as with international audiences. 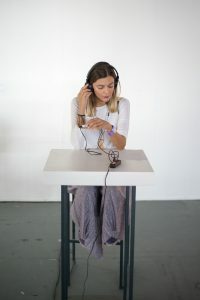 Evi Karathanasopoulou, Air Free, 2018, (audience member listening). Mentoring relationships can take time to forge. We offer an opportunity to cultivate your expertise in developing research bids by joining a specific bidding team from the outset of its project. Are you interested in learning more about how to go about applying for research funding, particularly larger Research Council bids? Would you like to gain experience by joining us in the process of developing, writing and submitting a large bid to the AHRC? Are you intrigued by concepts such as student co-creation, generational issues and concerns, the use of media in learning and dissemination, social work, social psychology and narrative methods—all with teens? 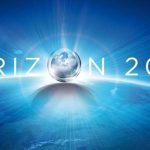 We are looking for one or two academics with an interest in not only developing their expertise in grant writing, but also participating in a research and dissemination project involving Generation Z youth. 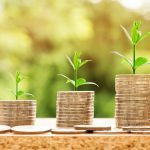 Working with experts with success in writing large grant proposals, you will engage in the process, from the very beginning through submission. You also will have the opportunity to develop a role that you might play in the project itself, when successful. Win-win, in other words. 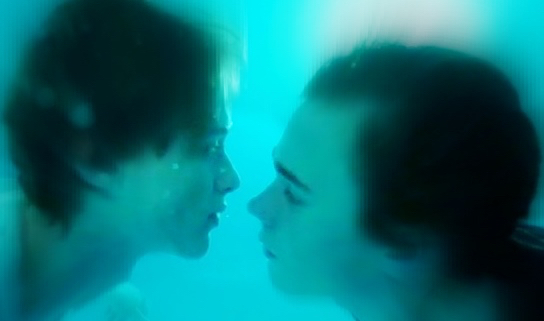 Skam”, the Norwegian TV series about Oslo teenagers, has influenced our concept and will be used to engage local youth in telling their own stories. 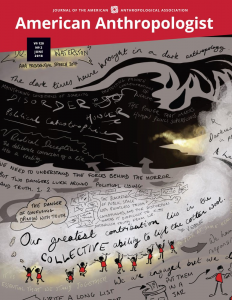 The first review by a Bournemouth University academic in the prestigious journal American Anthropologist was published in its February issue. Dr. Sue Sudbury who is Principal Academic in Media Production reviewed the film ‘The Anthropologist’ . She wrote in this Open Access review that this film raises many interesting issues about the role of the anthropologist and deftly illustrates the divide that exists when different cultures come together. Her conclusion of the review is that ‘The Anthropologist’ is an intriguing and memorable film about environmental anthropologists and the important work they do collecting and telling the stories of people whose lives are being reshaped by climate change. It is also about the relationship between female anthropologists and their daughters. As such, it does an important job of introducing the subject and will no doubt generate discussion, but it is not an anthropological film and doesn’t claim to be. The second one, a book review this time, appeared this week in the June issue. 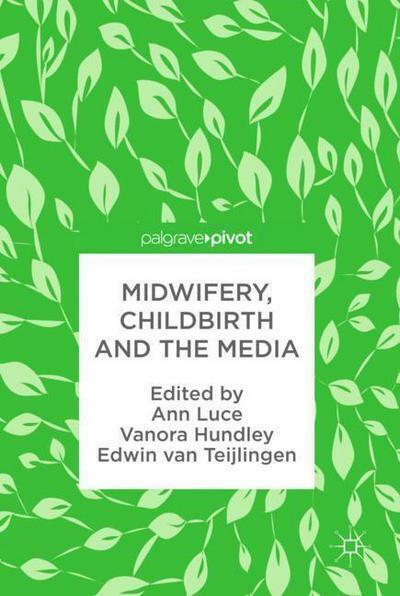 Prof. Edwin van Teijlingen in Bournemouth University’s Centre for Midwifery, Maternal & Perinatal Health (CMMPH) reviewed the book Midwives and Mothers: The Medicalization of Childbirth on a Guatemalan Plantation by the American anthropologist Sheila Cosminsky . He reminds the reader that some of the work in this book work has previously been published in articles, as clearly stated in the acknowledgments (p. xii). He highlights that “on reading the book I remembered with joy snippets from some of the articles on Doña María I read nearly thirty years ago while working on my PhD thesis.” Cosminsky does a great job of bringing together a lifetime of anthropological (field)work in a comprehensive and easy‐to‐read book. It is not often that we see reviews written by BU staff in this impressive journal, let alone two in subsequent issues. Sudbury S. (2018) The Anthropologist Seth Kramer, Daniel A. Miller, and Jeremy Newberger, dirs. 81 mins. English, Russian, Sakha, Kiribati, Spanish, and Quechua with English subtitles. New York: Ironbound Films, 2015, American Anthropologist 120(1): 169-170.
van Teijlingen E. (2018) Midwives and Mothers: The Medicalization of Childbirth on a Guatemalan Plantation by Sheila Cosminsky, American Anthropologist 120(2): 369. The untimely death from cancer of former UK Labour cabinet minister, Dame Tessa Jowell, has triggered a wave of tributes from across the political spectrum. Her vision for securing the 2012 Olympics for London, her formative role in New Labour’s flagship Sure Start scheme, and most recently, her campaign for cancer research, have all been given many column inches. By contrast, Jowell’s less certain legacy as principal advocate for media literacy is barely given a mention. 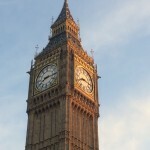 It seems to have been quietly forgotten that it was Jowell, as secretary of state for Culture, Media and Sport, that pushed through parliament the Communications Act 2003 which enshrined media literacy in law, and gave to Ofcom – the (then new) media “super-regulator” – the responsibility to “promote” the idea. Media literacy existed as a New Labour policy well before Jowell’s turn at the Department for Culture Media and Sport (DCMS). Her predecessor, Chris Smith, believed that the concept was a useful one for “arming the citizen-consumer” of media, to make responsible choices in a period of increasing deregulation. To the dismay of some of her own policy advisors, Jowell seized the concept, made it her own, and became a fervent advocate at every opportunity. In an address given at BAFTA the year following the Communications Act, she referred to media literacy as “a coming subject” and one that “in five years’ time will be just another given”. With the benefit of hindsight, Jowell’s optimism seems to have been misplaced. Media literacy, arguably, has never been lower on the political agenda. The plethora of initiatives that sprang up in the wake of the Communications Act have largely withered on the vine – and the process of recent reforms to the popular Media Studies A-level have seen the subject savagely “strangled”. Yet Jowell’s argument for media education has never been more relevant. “It is important,” she insisted, “that we know when we are watching ‘accurate and impartial’ news coverage and when we are not”. These are prescient comments when you consider that they were made more than a decade before “post-truth” became the Oxford Dictionary’s Word of the Year (in 2016) and when terms such as “fake news” or “Leveson Inquiry” had yet to pass anyone’s lips. Jowell believed that education in media opened opportunities that could enrich the experience of individuals and society – but she was equally exercised about the role that education had to play in protecting against some of the dangers of modern media. She thought that media were dominated by powerful and potentially harmful commercial and political interests. She believed that children, in particular, should be provided with “critical life skills” to guide their media consumption. “It is transparently important,” she told a media literacy seminar in 2004, “that they should be helped to get the most from all those screen hours, and be protected from what we know are some of the worst excesses”. She went on to ensure that, from 2006, the BBC Charter also contained requirements to promote media literacy. The key to understanding the marginalisation of media literacy as government policy is the role of the Department for Education – once known as the Department for Education and Skills(DfES). Media education was not seen as a serious curriculum priority at the DfES, and – despite New Labour’s early insistence on “joined-up government” – enthusiasm for media literacy never spread beyond the confines of DCMS. There was widespread ignorance about media education among civil servants within DfES, many of whom had had highly traditional educational experiences themselves. A preoccupation with “driving up” standards, measurability and international comparison provided little incentive for the promotion of a field of study concerned with recognising and understanding forms of popular (or “low”) culture. This was despite the apparent economic value being attributed to the “creative industries” at the same time. The byzantine operation of the DfES also made change of any kind difficult – particularly where it touched on what was actually taught in schools. In this case, there was the added disincentive of a policy being driven by a separate –and junior – department. Ultimately, media literacy was never to be widely embraced as an educational project in the way that Jowell had hoped. I believe that in the modern world, media literacy will become as important a skill as maths or science. Decoding our media will become as important to our lives as citizens as understanding literature is to our cultural lives. It may be too much to hope that media literacy could yet be reclaimed as one of Tessa Jowell’s essential legacies. AHRC blog tells how film RUFUS STONE has inspired a project on the next generation. RUFUS STONE’s Project lead, Kip Jones’ new project – “Rufus Stone … the next Generation’ – hopes to contribute to knowledge on the substantive topic of ‘Post-Millennials’ or ‘Generation Z’ (Gen Z), focusing on their anxieties and ambiguous approaches around gender and sexuality. Read about the plans for the project on the AHRC blog. Academics interested in participating in the project can contact Kip Jones for a chat. Join us to reflect on revolutionary relationships and revolutionary politics which challenged authority then and which influence us now. The cultural forces and the political movements of 1967 and 1968 aimed to change the world, and did so. Recent development of some populist and protest politics could be seen as a continuation of the revolutionary movements in the 1960s. Hedonic themes that recall the summer of love suffuse contemporary life, and self-reflection and emotional literacy have also become prominent values, linked towards human diversity and the international community. We have over 37 panels that include interdisciiplinary academic papers from renowned international scholars from the spheres of history, politics, feminism, psychoanalysis, sociology and also art, digital media, poetry and social dreaming workshops and film screenings . On Friday evening there is a public engagement Cabaret event with poetry, music and comedy and everyone is welcome! Hope to see you there and please do circulate to colleagues! Sorry to inform you that this Wednesday’s ‘In Conversation’ CQR Seminar is cancelled due to illness. Mark you diaries now, however, for the next Seminar on Wed. 11 April at 1 pm in RLH 208 presented by the ‘Gang of Four’. Curious? More information will follow. Stay tuned! 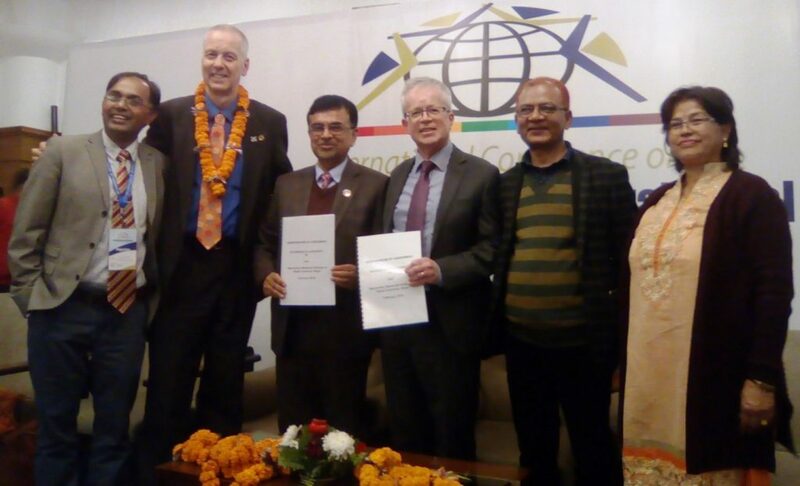 This weekend Manmohan Memorial Institute of Health Sciences (MMIHS) in Kathmandu, Nepal signed a Memorandum of Agreement (MoA) with Bournemouth University (BU). 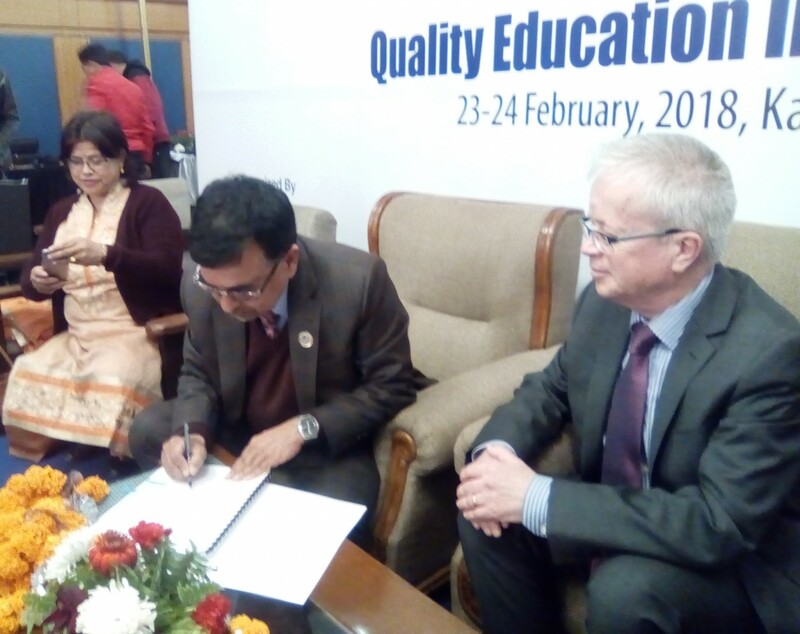 The ceremonial signing took place on the final day (24th Feb.) of the International Conference on Quality Education in Federal Nepal. 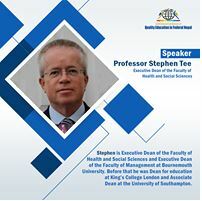 Prof. Stephen Tee, who also spoke at the conference, represented our university. The UoA formalises a long-standing collaboration between the two institutions. MMIHS and BU academics have jointly applied for research grants, conducted collaborative research and published together. Several BU staff [1-3] and students  in the Faculty of Health & Social Sciences have published in the Journal of Manmohan Memorial Institute of Health Sciences, an Open Access journal. Moreover, Prof. Edwin van Teijlingen in the Centre for Midwifery, Maternal and Perinatal Health has been a Visiting Professor at MMIHS for nearly a decade and has given several guest lectures over the years to staff and students at MMIHS. Regmi, P., van Teijlingen, E., Simkhada, P, Kurmi, O, Pant, P. (2017) What can we learn from the Nepal Health Facility Survey 2015? Journal of Manmohan Memorial Institute of Health Sciences 3(1): 1-5.
van Teijlingen, E., Marahatta, S.B., Simkhada, P., McIver, M., Sharma, J.P. (2017) Developing an international higher education partnerships between high & low-income countries: two case studies Journal of Manmohan Memorial Institute of Health Sciences, 3(1): 94-100. 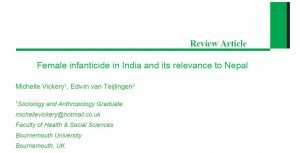 Vickery, M. van Teijlingen, E., (2017) Female infanticide in India and its relevance to Nepal Journal of Manmohan Memorial Institute of Health Sciences (JMMIHS) 3(1): 79-85. The two-day International Conference on Quality Education in Federal Nepal has just started in Kathmandu. Prof. Stephen Tee, executive dean of FMC and FMSS is one of the invited guests giving a short opening address. He spoke after the organisers had shown Prof. John Vinney’s recorded supporting message from Bournemouth University. Steve was part of the plenary session with the theme ‘Quality in Higher Education’. 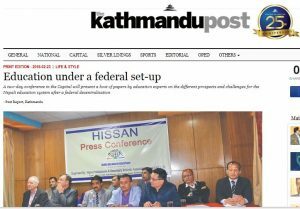 This international conference has already attracted national media attention as the pre-conference press conference was reported in The Kathmandu Post today (click here to read news story). BU Briefing – Locating the ‘third voice’: participatory film making and the everyday in rural India. 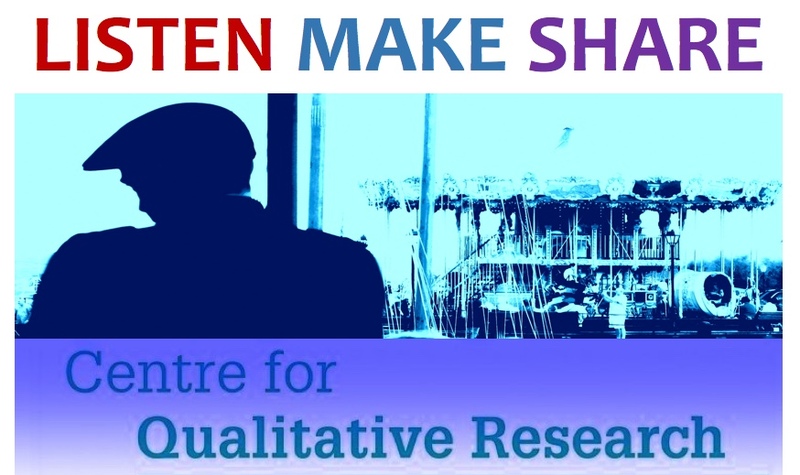 This research reflects on practice-led research involving a community video project in southern India – Andhra Pradesh. Four of the women involved in this project were asked if they would use their cameras to film their everyday lives. 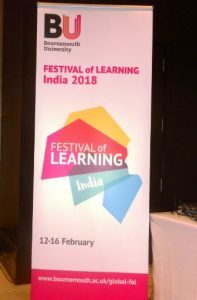 The aim of this paper was to build on current practice by combining participatory filmmaking with traditional observational documentary techniques and video diary interviews to locate a ‘third voice’ in order to create an engaging narrative and new perspectives on life in rural India. For more information about the research, contact Dr Sue Sudbury at smsudbury@bournemouth.ac.uk. This last week two separate papers have been accepted on aspects of health and well-being among migrants workers from Nepal. The first in the International Journal of Migration, Health and Social Care is based on a completed PhD project in the Faculty of Health & Social Sciences with Dr. Pratik Adhikary as first author . This paper ‘Health and well-being of Nepalese migrant workers abroad’ is co-authored by two former FHSS staff Dr. Zoe Sheppard and Dr. Steve Keen, and Prof. Edwin van Teijlingen of the Centre for Midwifery, Maternal & Perinatal Health (CMMPH). The second paper ‘A study of Health Problems of Nepalese Female Migrants Workers in the Middle-East and Malaysia’ was accepted by the Open Access journal BMC International Health & Human Rights . The lead author of this paper is Bournemouth University (BU) Visiting Faculty Prof. Padam Simkhada (based at Liverpool John Moores University) and two of his co-authors are based in Nepal: Manju Gurung (chair of Pourakhi Nepal) and Dr. Sharada Prasad Wasti and one at BU: Prof. Edwin van Teijlingen . 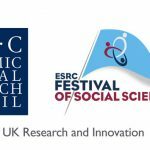 There is a growing momentum in migration research at BU with further academic papers being published related to studies on migrant workers from Nepal [4-8], relatives of migrant workers , migration into the UK [10-12], Eastern European migration issues [13-15], migration and tourism , migration and the media  as well as migration in the past . Simkhada, P.P., van Teijlingen, E.R., Gurung, M., Wasti, S. (2018) A study of Health Problems of Nepalese Female Migrants Workers in the Middle-East and Malaysia, BMC International Health & Human Rights (accepted Jan.). Adhikary, P., Simkhada, P.P., van Teijlingen E., Raja, AE. (2008) Health & Lifestyle of Nepalese Migrants in the UK BMC International Health & Human Rights 8(6). Web address: www.biomedcentral.com/1472-698X/8/6. Scammell, J., 2016. 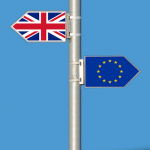 Nurse migration and the EU: how are UK nurses prepared? British Journal of Nursing, 25 (13), p. 764. Holscher, J., 2017. The effects of Brexit on the EU, the UK and Dorset – a migrant’s account. BAFES Working Papers, 1-11. Filimonau, V., Mika, M. (2017) Return labour migration: an exploratory study of Polish migrant workers from the UK hospitality industry. Current Issues in Tourism, 1-22. Janta, H., Ladkin, A., Brown, L., Lugosi, P., 2011. Employment experiences of Polish migrant workers in the UK hospitality sector. Tourism Management, 32 (5): 1006-1019. Mai, N., Schwandner-Sievers, S. (2003) Albanian migration and new transnationalisms, Journal of Ethnic & Migration Studies 29(6): 939-948. Dwyer, L., Seetaram, N., Forsyth, P., Brian, K. (2014) Is the Migration-Tourism Relationship only about VFR? Annals of Tourism Research, 46: 130-143. Marino, S., Dawes, S. (2016). Fortress Europe: Media, Migration and Borders. Networking Knowledge, 9 (4). Parker Pearson, M., Richards, C., Allen, M., Payne, A., Welham, K. (2004) The Stonehenge Riverside project Research design and initial results Journal of Nordic Archaeological Science 14: 45–60. 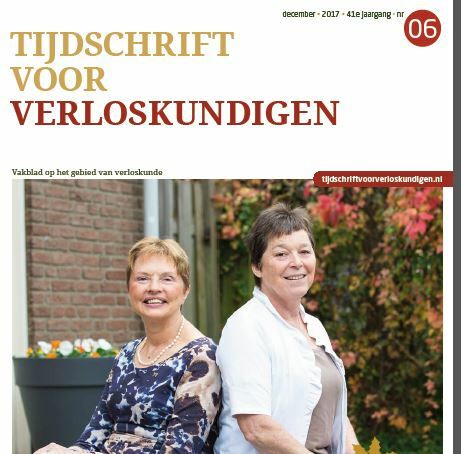 The final issue for 2017 of the Dutch Journal for Midwives, Nederlands Tijdschrift voor Verloskundigen, published our contribution on midwives and the media . 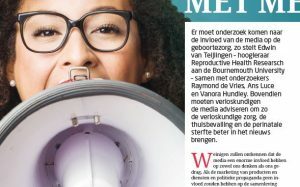 The two-page article ‘MEER BEMOEIEN MET MEDIA’ argues (in Dutch) that midwives as individuals and as a profession must try to engage with the media. Midwives should be open to starting a dialogue concerning issues around maternity care and midwifery. 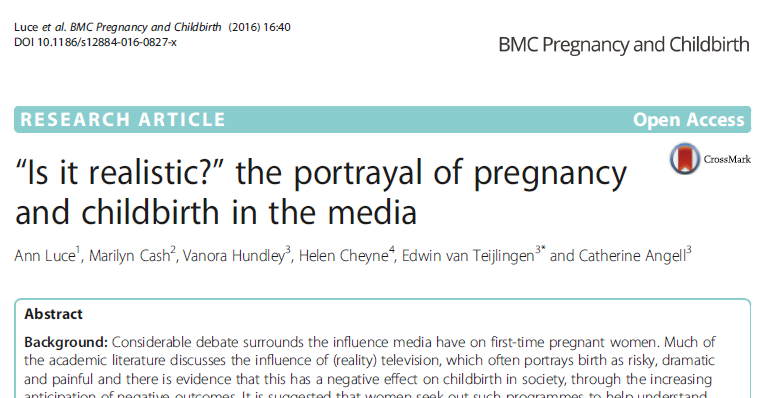 This article published in a practitioners’ journal builds on the collaborative research conducted at Bournemouth University around midwifery and the media [2-4], and our recently published edited book on the topic . van Teijlingen, E., De Vries, R., Luce, A., Hundley, V. (2017) Meer bemoeien met media (In Dutch: more engagement with media). 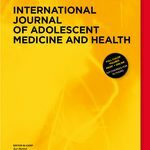 Tijdschrift voor Verloskundigen (in Dutch: Journal for Midwives), 41 (6):28-29. Two days ago saw the publication of the latest paper on migration research here at Bournemouth University. The journal Health Prospect published ‘Risky work: Accidents among Nepalese migrant workers in Malaysia, Qatar and Saudi’ . This new paper is based on the PhD research project conducted by Dr. Pratik Adhikary. Health Prospect is a peer-reviewed Open Access journal, part of Nepal Journals Online (NepJOL) which offers free access to research on and/or from Nepal. 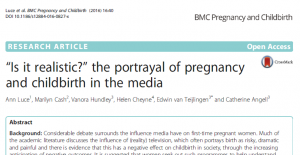 The paper is co-authored by former FHSS staff Dr. Zoe Sheppard and Dr. Steve Keen as well as Prof. Edwin van Teijlingen of the Centre for Midwifery, Maternal & Perinatal Health (CMMPH). Previous academic papers by BU scholars included, amongst others, work on migrant workers from Nepal [2-6], relatives of migrant workers , migrant health workers [8-9], migration and tourism [10-11], migrant workers from Eastern Europe [11-13], migration and the media  as well as migration in the past . The various strands of work link very well to BU’s application for Leverhulme Doctoral Scholarships. Marino, S., Dawes, S., 2016. Fortress Europe: Media, Migration and Borders. Networking Knowledge, 9 (4). Academic have been warned for a decade about predatory Open Access publishers (van Teijlingen 2014). These are commercial organisations charging academics a publication fee on submission of their manuscripts with a promise to publish their work quickly online. The problem is twofold: first, these commercial organisations don’t offer proper peer-review and editorial quality assurance; and secondly, academic are being tricked into believing the journal is a legitimate scientific publication. 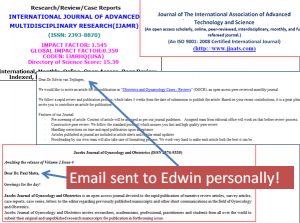 The second author receives on average six to eight invitations a week to publish in this kind of predatory journals – see below for examples. The first author, who despite having not worked in an academic institution for over three years, still receives such invitations to publish in ‘Journal X’. 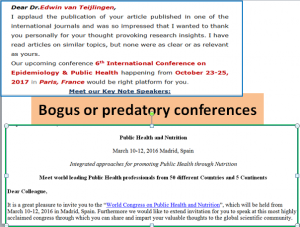 A similar phenomenon to predatory journals is the predatory conference (Moital 2014; Nobes 2017; Grove 2017). These are pretend academic conferences of questionable value, established first and foremost to make money, not for the greater good of the academic discipline. 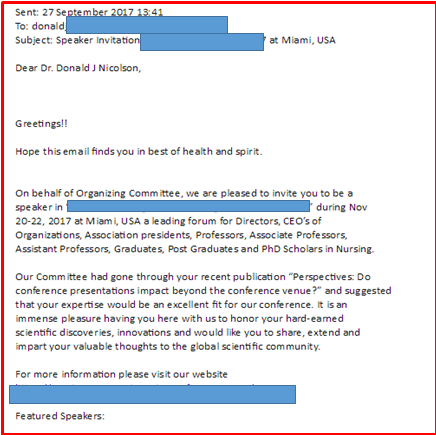 Both authors have received bogus and legitimate invitations to attend conferences. A predicament with such an invitation, which 99% of time arrives by email, is that it is not easy to distinguish between fake and real offers. For example, the first author recently received an offer (at short notice), to attend a conference in Miami in November 2017 (see below). This was on the back of an editorial he had published couple of months earlier. For a career researcher going from contract to contract, the appeal of being invited to present a keynote at a conference can be flattering, far less an honour and a boost for one’s career. Therefore, while the idea that if it seems too good to be true, is a prudent one to hold; there is also a temptation to follow through. The author replied to the request quizzing the reason for the invite out of the blue. The answer was less than convincing, and a swift email by the author saying “Don’t tell me… You are offering me a keynote with travel and accommodation… Lol! !” called their bluff and ended correspondence. But digging a little deeper he found there was a webpage dedicated to taking payments to attend the conference. In the digital world, a fool can be easily and quickly separated from his or her money. The conference email invitation looks very convincing (if not don’t even read it!). The venue is good location as Nobes (2017) highlighted, “the organizers are more interested in marketing the tourist destination rather than the academic value of the conference”. 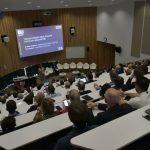 The conference covers too many different aspects or topics, as if the advert is designed to catch the eye of many people as possible who are vaguely connected to the discipline. Mentions on associated predatory journals and ‘important’ organisations in the discipline. Email and bank accounts that don’t look professional/ official. Little mention of attendance fees, but after acceptance emails demanding a high conference fee and other charges. Conference organisers are not academics, or unknown names. Even more advertising than normal at a scientific conference. 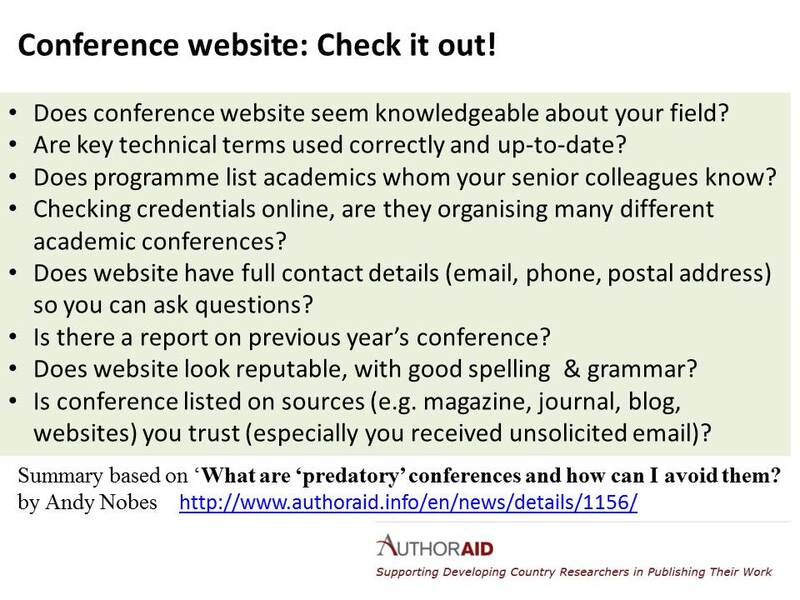 Furthermore, Andy Nobes (2017) offered some helpful advice on quality of the conference websites in the list below. Andy is based at AuthorAID, a global network providing support, mentoring, resources and training for researchers in developing countries. 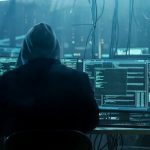 Who is at risk of falling for predatory conferences? Academics need to be aware of money-making conferences and meetings without a true commitment to science. But some academics might be more at risk than others. Young researchers, PhD students and fledgling academics, living from contract to contract may feel any conference attendance is a potential career boost. Thus, such an invitation might seem flattering and an opportunity to good to miss. A way to show that he or she is a capable and independent academic. Most academics go to conferences for a combination of presenting their work to get critical feedback, making new contacts, sharing ideas and to be inspired. With such broad combination of motivating factors, the exact purpose of conferences is difficult to ascertain because there is no a priori agreed role and value of conferences (Nicolson, 2017a). 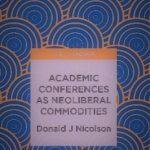 However, there is evidence that academic conferences function to facilitate commodity transactions, be that knowledge, tools, skills, reputations, or connections, which reflects the neoliberal ethos in the modern academy (Nicolson 2017b). The predatory conference can be viewed in this light, where academia is more and more focused on generating revenue. It is at best scurrilous, and worst, criminal, for organisations to make money using such a confidence trick. Always check which conferences are organised and advertised by recognised scholarly organisations in your own discipline. If uncertain ask a more experienced academic, a senior colleague or mentor. Moital, M. (2014) Ten Signs of a Bogus/Fake Conference. Nicolson, D.J. (2017a) Do conference presentations impact beyond the conference venue? Journal of Research in Nursing. 22(5), pp.422-425. Nobes, A. (2017) What are ‘predatory’ conferences and how can I avoid them? van Teijlingen, E. (2014) Beware of rogue journals. The Communications Act 2003 requires the UK’s media regulator Ofcom to promote ‘media literacy’, although it left the term undefined. 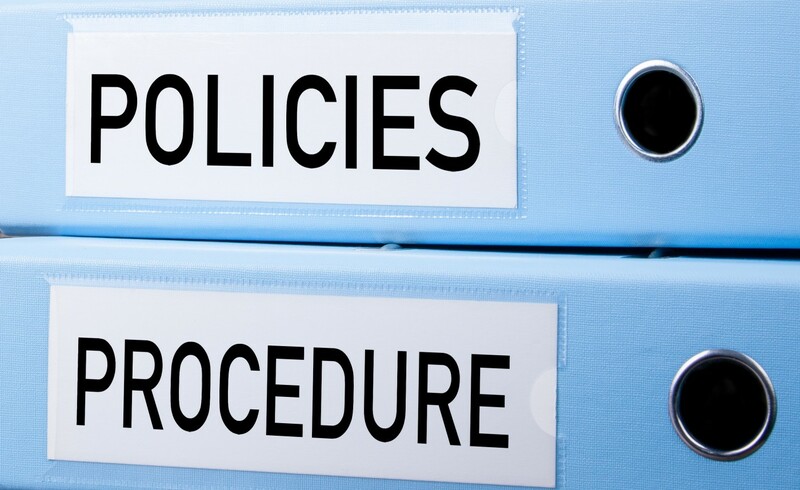 In response to the new legislation, the regulator espoused a deliberately generalised definition, but one that never became a meaningful measure of its own policy work. This paper investigates how Ofcom managed this regulatory duty from 2003 onwards. It explores how the promotion of media literacy was progressively reduced in scope over time as its funding was incrementally withdrawn. Media literacy in 2016 may be characterised as one of the zombies of cultural policy: an instrument devoid of its original life but continuing in a limited state of animation governed by other policy priorities. For more information about the research, contact Dr Richard Wallis at rwallis@bournemouth.ac.uk.